Women, Community and Environment Series! Events for the 8th year of this series will be spread across the community from February 21st through February 23rd. The overall theme will focus on water, health and look at what is happening in Michigan. Events will focus on what it means to be an activist and how to do advocacy work. The series will engage participants in networking, panel discussions, and a workshop. The series will culminate with our keynote speaker – Senator Stephanie Chang – and awards reception on February 23rd. This year’s three-day series will deliver inspiring social and learning opportunities, raise awareness towards actionable environmental issues in the community, bring together a wide-ranging network of women, as well as provide connections and resources for civic engagement. Hundreds of women and men participate annually. Stephanie is serving her second term representing Michigan House District 6, where she is Minority Vice-Chair of the House Committee on Law and Justice and serves on the House Committees on Education Reform and Natural Resources. Much of her legislative work is focused on air quality, affordable and safe drinking water, education, criminal justice reforms, and improving economic opportunities. Before serving in the Legislature, Stephanie worked as a community organizer in Detroit. She served as the state director for NextGen Climate Michigan, the alumni engagement and evaluation coordinator for the Center for Progressive Leadership in Michigan, the community engagement coordinator for the James and Grace Lee Boggs School, the deputy director for the Campaign for Justice, an organizer for Michigan United/One United Michigan and as an assistant to Grace Lee Boggs. In 2014, Stephanie became the first Asian American woman elected to the Michigan legislature. She was raised in Canton and is the daughter of parents who emigrated to the United States from Taiwan to pursue greater opportunities. Stephanie is a graduate of the University of Michigan with a bachelor’s degree in psychology and master’s degrees in public policy and in social work. Stephanie and her husband, Sean, live in Detroit and are the parents of a young daughter. This year tickets for the Women, Environment and Community Series are all-inclusive. Your ticket will give you access to all of this year’s great events. Meet other folks attending the Series and hear from women who are local environmental activists. This film by Leana Hosea focuses on water justice in Flint and at Standing Rock by examining the lives and work of two women deeply involved in these issues. Advocacy Workshop – Participants will have the opportunity to meet representatives of a variety of local and state-wide environmental organizations and learn about getting activated to advocate for the environment. Hidden Heroine Awards – celebrate local women who are taking action right now to protect the environment! 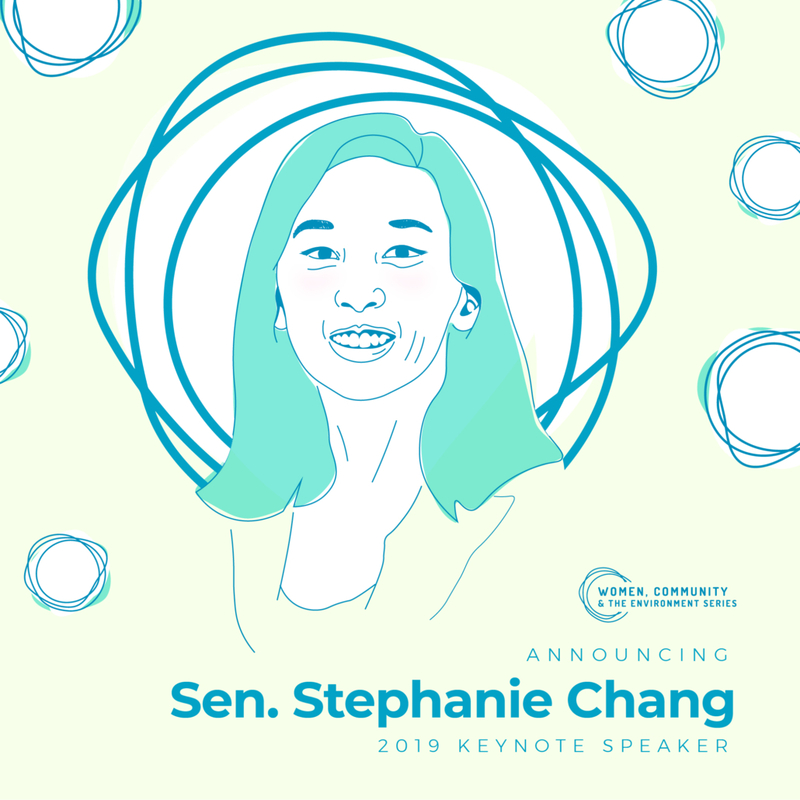 Keynote Address – join us to hear state Senator Stephanie Chang, a longtime environmental advocate, speak about Michigan’s environmental challenges and solutions. Reception – finish the day with a reception to network and digest everything you’ve learned! Every year WMEAC seeks to highlight the work of female leaders in our West Michigan community who are working to improve our environment and keep our community safe. Through these woman-initiated environmental justice efforts, the social equity of West Michigan continues to improve, offering inclusive and accessible living conditions, including, but not limited to, healthy homes, clean air, and clean water. If you’d like to nominate someone who fits into one of these three categories, please use this form. The Women of Hope Award honors a forward-looking, up-and-coming environmental advocate who represents hope for environmental activism. This Woman of Hope also provides environmental engagement through her fresh voice and diverse perspective to the ongoing efforts to improve the environment. The Women of Inspiration Award honors a woman at the forefront of the current environmental movement. As a contemporary environmental leader, the Woman of Inspiration also brings seasoned environmental experience and motivation to those around her, embodying inspiration through environmental advocacy. The Women of Vision Award honors a woman who is a veteran in environmental activism. Through her hard work, determination, experience, and leadership, the Woman of Vision has built a legacy of environmental advocacy. This award is a tribute to women who are and have been environmental visionaries. * Please note that the selection committee reserves the right to select a different award category based on the information provided in your nomination.